The alliance had ended its failed 1703 campaign in the Spanish Netherlands with the siege of Limbourg. This had been executed by a detachment under the Prince of Hessen-Kassel, while the main army stayed in camp at St. Truyen. During this siege the alliance decided that next year's campaign would start on the Moselle1. After Limbourg had capitulated on 27 September a detachment of 17 battalions and 24 squadrons under Hessen-Kassel therefore stayed in Verviers instead of returning to the main army. Traces of the plans for winter quarters near the Moselle can be found in the preliminary plan of 10 September, which was officially offered to the States General on 19 September. A later project of 24 October called for 22 battalions and 50 squadrons to take winter quarters in Germany in addition to Van Goor's corps which was already on the Upper Rhine. These would occupy a 'posteringslinie' from Düren to Koblenz, which meant occupying Düren, Niedeck, Gemund, Schleiden, Munstereiffel, Aremberg, Altenahr, Ahrweiler, Zinzich, Andernach and Koblenz and to the west: Aachen, Limbourg and Montjoye2. The French were quite aware of the possibility something happening on the Moselle and had therefore detached a corps under Pracontal. This was at Ciney on 18 September and at Jemeppe (near Marche) on 23 September. He had orders to immediately march to the Moselle in case Hessen-Kassel would do so. Of course Hessen-Kassel had similar orders. Meanwhile the French made some feint maneuvers like assembling artillery for a supposed siege of Huy and moved Pracontal a bit closer. He reached Laneuville on 14 October. Under normal circumstances all the above would only have led to some maneuvering towards the winter quarters, but now things were complicated by an offensive on the Upper Rhine by Tallard. Tallard had very easily taken Breisach on 7 September and this windfall probably induced him to try a late offensive on the Upper Rhine. On 12 October he closed in on Landau and on 17 October the trenches were started. While this happened Marlborough was at the palatine court in Düsseldorp from 14 October in order to pay the queen's compliments to Charles III, who was passing by on his way to Spain. Of course the Elector Palatine immediately asked Marlborough for help3. At first he did not believe the French were serious, but the alliance was soon convinced of the contrary. It was probably the news that Landau had been closed in that moved the States General to give permission to make a move Germany. On 19 October the States gave permission to move 22 battalions which had been meant for the 'posteringslinie' as far as Koblenz. On 20 October they then gave the deputies permission to let this detachment under Hessen-Kassel go beyond the Moselle4. On 20 October or shortly before, all this resulted in Hessen-Kassel getting orders to besiege Trarbach. On 28 October the States General then changed these orders so that the deputies were allowed to let Hessen-Kassel move to lift the siege of Landau. In order to do this Hessen-Kassel would have to cooperate with the Count of Nassau-Weilburg. He was on the right bank of the Rhine with 24 battalions and 18 squadrons of the Pfalz, the Upper Rhine Kreitz and the Westphalian Kreitz. From 9-27 October 1703 Hessen-Kassel had been near Sart and Jalhay. On 24 October he then marched to Baelen and next to Corneliemunster where some Luneburg troops from Maastricht joined him. 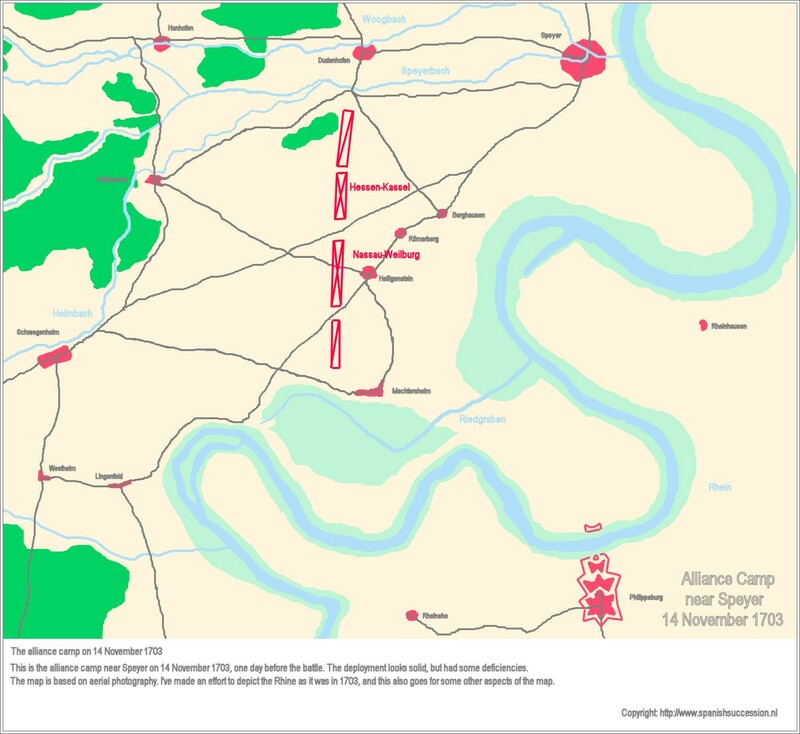 The army then moved somewhat closer to Aachen. Then it left from Burtscheid on 31 October and moved to Euskirchen. Here the deputy Van Rechteren joined the army on 3 November and the army moved on to Koblenz. The army then arrived in Koblenz on 6 or 8 November5. Pracontal reacted quickly; as soon as he heard that Hessen-Kassel had left he moved to the Moselle too. He first moved to Bertrange and then reached Saarlouis on 10 November. Hessen-Kassel's army consisted of 22 battalions, 14 cavalry squadrons and 29 dragoon squadrons. Of these 13 battalions and 18 squadrons were troops hired from Luneburg (Hannover). In order to understand what happened next we have to consider that most German troops were hired to operate in a certain area. It seems that the conditions on which these troops from Luneburg had been hired did not allow them to operate south of the Moselle. Therefore the Luneburg generals Bülow and Sommerfeldt had already protested against moving further than the Moselle when the march started. Upon arriving in Koblenz the Luneburg troops then refused to move further. Couriers were then dispatched to Hannover to get permission to march onwards, but Hessen-Kassel judged that he could not wait for this and moved on without the Luneburg troops. Hessen-Kassel moved on by way of Simmern and Kreuznach and here his army rested on the 10th6. On 11 November Nassau-Weilburg met Hessen-Kassel for a conference while the army was near Alzey. Here he stated that his army would consist of 20 battalions and 27 squadrons. This was somewhat less than promised before, but had to do with leaving some squadrons in the Stollhofen lines. They also decided to pass Speyer on the 13th. Nassau-Weilburg had crossed the Rhine near Mühlburg-Daxlanden on 10 November with about 4,000 men. He had also signaled the arrival of the relief force by firing a few volleys with his artillery. That same day he camped near Leimersheim. His troops then marched on to Speyer by way of Hördt and Germersheim (both not on the map) and crossed the Speyerbach. 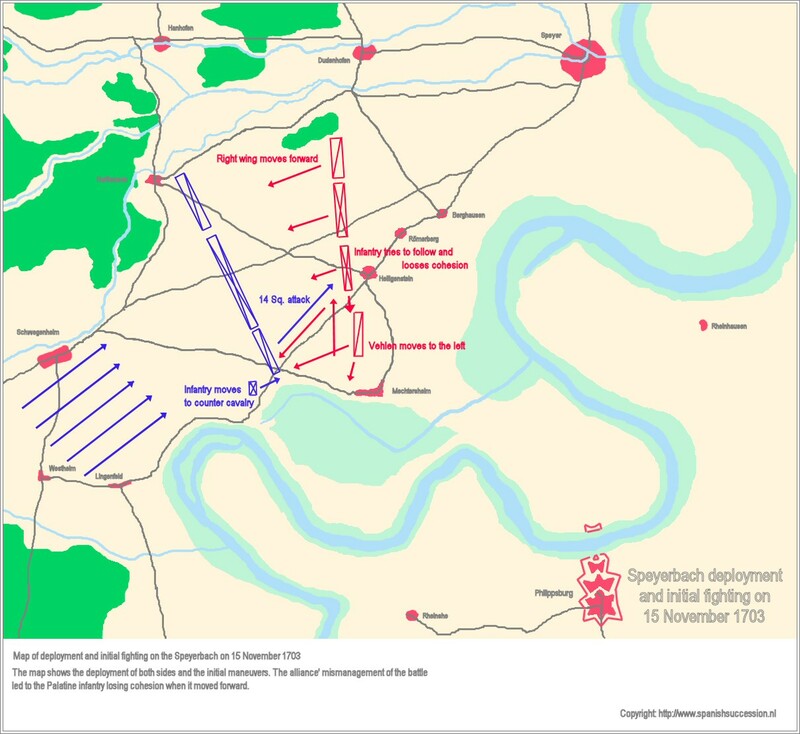 On 13 November at about 2:00 PM the armies met north of the Speyerbach. They then felt strong enough to make camp south of the Speyerbach, and so bridges were made to enable the Hessen-Kassel force to cross. Night had fallen when the last troops had crossed. Nassau-Weilburg and Hessen-Kassel decided to march to Landau on 16 November and have often been criticized for this decision. The reasons for this delay are however very sound. Most of the Hessen-Kassel infantry had not yet arrived and would in fact only arrive on 14 November at 10:00 PM7. Furthermore the arrival of 2 Mainz battalions, 2 Luneburg battalions, 1 Hessen-Darmstadt battalion and 1 Hessen-Darmstadt cavalry regiment was expected on the 15th8. On 14 November a reconnaissance party of 400 cavalry was sent to gather information. It reported an encounter with 14 enemy squadrons near Weingarten in the afternoon. These were probably troops under M. de Streff, who had been sent to reconnoiter the way from Pilippsburg. Notwithstanding this the alliance command concluded that the French were still far away. On 15 November Hessen-Kassel and Nassau-Weilburg were therefore resting in camp southwest of Speyer. From Saarlouis Pracontal reached Saarbrücken on 12 November. Tallard had meanwhile decided not to wait for the alliance in the circumvallation of Landau, but to march north and deliver a battle in conjunction with Pracontals troops. Tallard therefore left De Laubanie in command of the siege of Landau and in the night of 14 November he marched to Essingen with 28 battalions and 53 squadrons. He had grasped the urgency of Pracontal's timely arrival and sent courier after courier to hurry him to their junction point at Essingen. The timely juncture succeeded when Pracontal met Tallard at this place in the morning of 15 November. The junction was not complete because Pracontal only brought his very tired cavalry (19 squadrons) and 800 infantry which had been loaded on wagons. It was too big for the troops which were present. Not all comments are justified, but in general one can say that this camp was indeed badly planned. The first remark is unjust: the alliance army was to march to Landau. Starting the march by crossing the Speyerbach on bridges would not have been a good start. The presence of the wood before the right flank cannot be checked by me. Kennel has it on his map, but seems to have taken it from an older map. There was however criticism that one could not exit the camp on the right10. The comment about presenting the left wing to the enemy is correct criticism. Looking at the map one could expect a French army to arrive in a northwest-southeast deployment. The alliance army was deployed from north to south, a deployment which was not in line with the geographical circumstances. This meant that in case of attack the alliance had to start with dangerous maneuvers in order to prevent the left wing from being overwhelmed. The fourth and fifth remarks are based on the fact that at the start of the battle or during the deployment for battle, large holes showed up between the units of the left wing. This also had to do with the fact that Nassau-Weilburg's units were far understrength. The disposition therefore meant that when the enemy tried to envelop the right wing, the already thinly spread troops of the left wing had to extend themselves even further to the south and could not present a solid front11. The alliance army was deployed as follows: The utter left wing was composed of the palatine cavalry under the Count of Vehlen. Next came the Pfalz infantry, the Hessen-Kassel infantry and the Hessen-Kassel dragoons and cavalry. On the 15th the command was gathered in Speyer and even some of the troops seem to have been there in order to celebrate the emperor's name day. These are the details of Hessen-Kassel's part of the army:12 Note that in this composition there are 16 cavalry and 29 dragoon squadrons. This points to an intent of the States General to indeed enable this army to use dragoons as infantry. There is some doubt about the actual composition of Nassau-Weilburg's army, but this is my best guess. One should note here that the number of units may seem impressive, but that due to the wretched state of the German armies at this time the actual number of soldiers in this army was significantly less than that in Hessen-Kassel's army. 19 Infantry French Apart from 800 men Pracontal's infantry was absent. The French army consisted of two parts; Tallard's army and Pracontal's detachment. Both contained a handful of units from the Spanish army of the Netherlands. After besieging Landau for some time the French infantry was probably not in a perfect state. In the morning of 15 November the alliance command had no idea that the French army was about to attack. The command was gathered in Speyer and was probably giving some attention to celebrating the emperor's name day. What is sure is that is was still quarreling about the command and still working on the order of battle by which it would move to Landau. Meanwhile perhaps only half the troops which were planned for this operation were present and the camp was ill-posed to defend against a French attack. This would have called for serious reconnaissance efforts, but subsequent events would prove that these had been neglected. In the night of 14-15 November Tallard had left the siege of Landau. He then spent the night at Niederessingen, where Pracontal's troops met him at 4:00 AM. At 7:00 AM the combined armies then marched in the direction of Speyer. The march took place in 5 columns with the cavalry at the wings and the artillery in the center. At about 12 o'clock these columns arrived on the plain east of Lingenfeld and Schwegenheim, were they were able to deploy for battle. 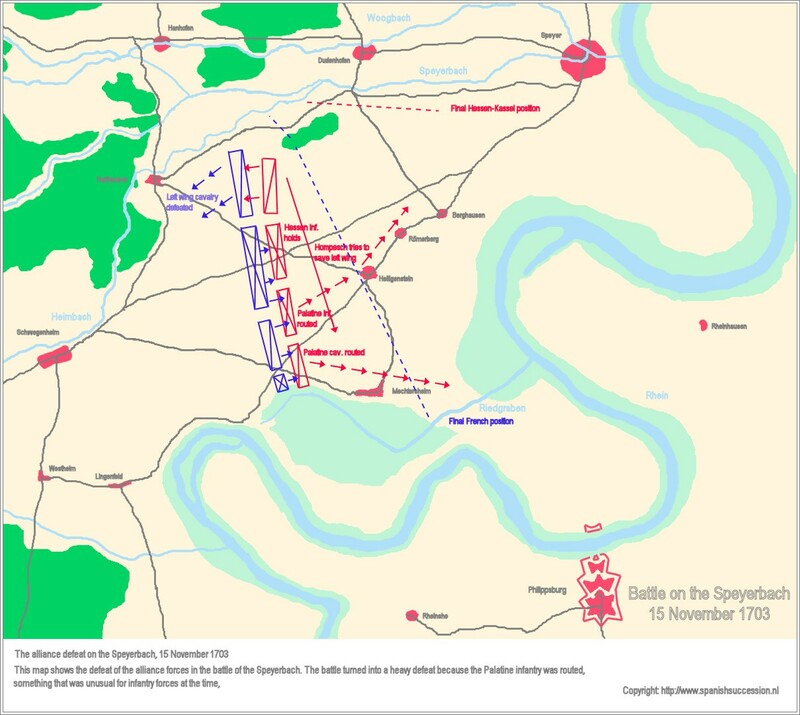 This difficult operation was complete by about 1 o'clock and the French army then moved eastward. At about 10:00 AM the command in Speyer got the first message that the French army was approaching. At first not much credit was given to this message and it was only after two French deserters arrived with the same message that the command took action. By then it was almost noon. Meanwhile the absence of the senior command meant that the units could deploy, but that the colonels often had no idea what their exact place in the line was. Of course this created a lot of confusion and panic. Now the bad disposition of the camp aggravated this. The utter left wing did not reach up to Mechtersheim / Riedgraben, and General Vehlen wanted to close this gap in order to prevent the envelopment of his wing. He therefore let his wing move to the left, but the infantry was not able to follow so quickly and so large gaps were created. Some have stated that the French command was not very well informed of the allied positions and numbers. However this may be, it appreciated the confusion in the left wing infantry as a good opportunity. Notwithstanding the fact that the first line had not yet been formed and the second line had not yet arrived it therefore ordered 14 squadrons of the right wing to attack. This attack on the Leibregiment, Rehbinder, Lübeck and Sachsen-Meiningen failed to destroy these regiments, but succeeded in passing through the gaps in their line. At about this moment Nassau-Weilburg arrived on the field and intervened with some of Count Vehlen's cavalry. This led to a defeat of the French cavalry and a pursuit in which the Palatine troops even conquered some of the French artillery for a while. However, in stead of disengaging his troops and reforming a line Nassau-Weilburg continued his Palatine cavalry in its forward position on a terrain which was not suitable for cavalry. The result of this premature fight was that the French and Hessen-Kassel troops were deployed properly, but that the Palatine troops were still in disorder when the real fight started at about 2:00 PM. At that time the whole French army attacked. On the left wing the French cavalry was decisively beaten by the first line of the alliance cavalry under Hessen-Homburg, Spiegel and Schulenburg. The French lost 19 standards and Pracontal was killed. In the center the French infantry may have come forward a bit, but it seems that here it was also mainly cavalry which attacked. At first this did not succeed in making a big impression on the Hessen-Kassel infantry. However, on their right wing the French were successful. On the utter right 6 battalions started by driving Vehlen's cavalry back. This cavalry lost its cohesion and fled. The French infantry attacked the Palatine infantry and this fled too. It's in doubt whether this was caused by a primary defeat of the cavalry or that these events were simultaneous. Hompesch, who commanded the second line of the alliance right wing cavalry then attempted to save the left wing, but he only succeeded in making its flight somewhat easier. The French then started to envelop the Hessen-Kassel battalions. This caused an enormous amount of casualties amongst these troops. The Hessian Grenadier regiment was almost annihilated and those of Stückradt, Schenck and Thielmann lost half or more of their strength15. The Luneburg regiment Carle received a lot of damage too. There is also a story about the French Navarre regiment using the bayonet but this belongs to the details. What might seem a detail is the fact that Hessen-Kassel at this stage personally led his troops on foot. The most remarkable aspect of this envelopment is that the Hessen-Kassel battalions were not broken or taken prisoner after the entire left wing had been routed. It therefore seems that these battalions were indeed able to retreat 'feet for feet' to the defile of Dudenhofen16. I therefore also suppose that the envelopment was primarily on the left side of the Hessen-Kassel units and that most of their backside was covered by Hompesch' cavalry. The courageous personal conduct of Hessen-Kassel may also have played its part in the affair. Anyway the battle ended when the Hessen-Kassel troops started to recross the Speyerbach at about 5 o'clock. The French did not hinder them in this operation. The Hessen-Kassel army had lost about 2,500 men killed, wounded or prisoner. Nassau-Weilburg's army had lost about 4,000 killed or wounded and about 2,000 prisoners. French losses were probably between 3,500 and 4,000 killed or wounded17. The most immediate result of the battle was that the alliance lost its supply train and artillery. Furthermore Landau started to capitulate at 5 o'clock. Furthermore a lot of French troops would winter north of Landau and could thus subsist on enemy territory. The already wretched imperial army had suffered a new shock and would be in an even more sorrow state in the next campaign. The troops from the Pfalz had also lost part of the economic basis for their maintenance. 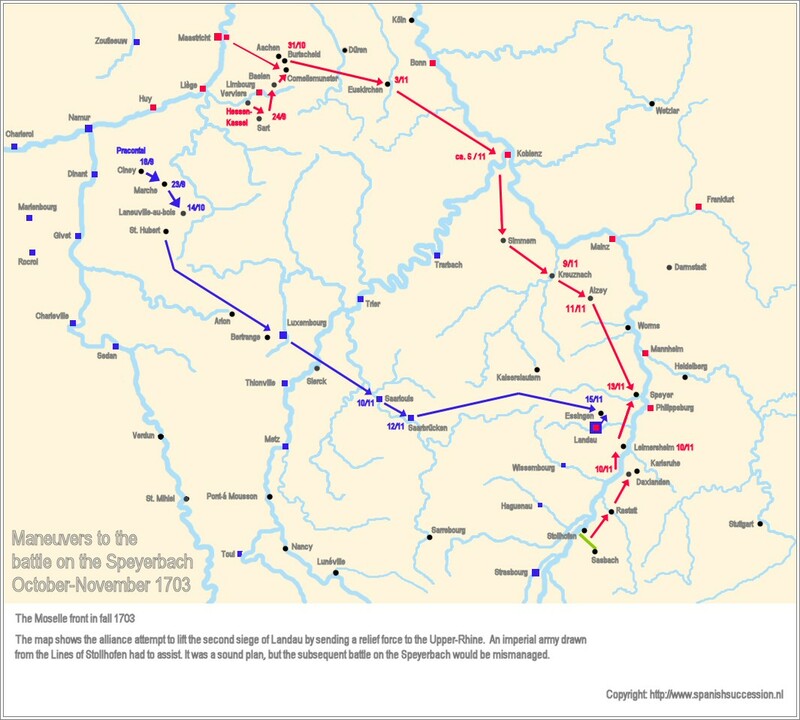 Apart from this the battle on the Speyerbach was not very decisive. It would only encourage the United Provinces to send even more troops to Germany. With an eye to the critical situation on the Upper Rhine Van Rechteren first decided that the battalion of Hirzel, the Prussian battalion and some dragoons would winter there. In December it was then decided to let the whole Hessen-Kessel force (except the Luneburg battalions) stay on the Upper Rhine. Including the 12 battalions commanded by Van Goor this brought the total of the Anglo-Dutch troops which would winter on the Upper-Rhine to 20 battalions and 29 squadrons. On the alliance side there was a lot of blame to be divided. First of all reproaches can be made to Hessen-Kassel and Nassau-Weilburg for having their headquarters in Speyer. In the position they were in at least one of them had to stay with the army. In stead almost all ranks above those of colonel were in Speyer. Secondly both failed to reconnoiter properly. Hessen-Kassel stated that he relied on Nassau-Weilburg for this, but when he obviously failed Hessen-Kassel could and should have done this himself. Hessen-Kassel then vindicated himself by his courageous and competent behavior which prevented any major disaster from happening to his troops. The conduct of Nassau-Weilburg on the battlefield might also have been courageous, but overall it cannot be said to have been competent. It had started with the bad disposition of the camp, it then continued with his squabbling over the command and his stay in Speyer. He also failed to reconnoiter and to appreciate the messages that did come in. Next he arrived far too late on the battlefield. There he posted himself at the head of his cavalry and did indeed execute some courageous attacks. For a commander in chief of an army the paramount responsibility was however to make sure that all troops were in line. Charging with the cavalry while the line was not closed is a sign of incompetence. On the French side Tallard achieved one of the biggest French victories of the war. Amongst historians there is however little doubt that this was more due to alliance mistakes than due to his skills as a commander. This may not be entirely fair and may have been influenced by his subsequent defeat on the Danube. The only mistake that Tallard actually made was that he let his cavalry prematurely charge the Palatine infantry. On the other hand one can suppose that without this charge the alliance deployment could have been completed in a much more orderly and effective way. Furthermore his drive ensured that his army was on the battlefield before the alliance army was complete. Therefore Tallard justly earned a lot of credits for this battle. This page is mainly based on Het Staatse Leger VIII/1 and 'Die Schlacht bei Speier' by Albert Kennel. Furthermore on the correspondence of Heinsius in 1702 and the Marlborough - Heinsius correspondence. 1) Marlborough to Heinsius from Verviers on 24 September 1703 Van 't Hoff nr. 146: 'Your deputys came here last night, and this afternoon I am to have a conference with them, soe that my next will give you an account of what wee can doe concerning the expedition of the Mosell. 2) For this see Het Staatse Leger VIII/I page 353. 4) For these dates see Het Staatse Leger VIII/I page 360. 8) Letter by Hessen-Kassel to Heinsius 18 November 1703. 12) For this see Het Staatse Leger VIII/I page 361. 13) Kennel, page 22 says their presence is not in lists of losses. 15) Het Staatse Leger VIII/I page 366, based on lists of losses. 16) Letter by Hessen-Kassel to Heinsius 18 November 1703: 'sus quoy je me retiray pas á pas par le beau milieu du champ de bataille sur le défilé de Dudenhoven'..
17) Kennel, page 47 has these numbers. Again the Hessen-Kassel losses are the most accurate because they are based on loss lists.